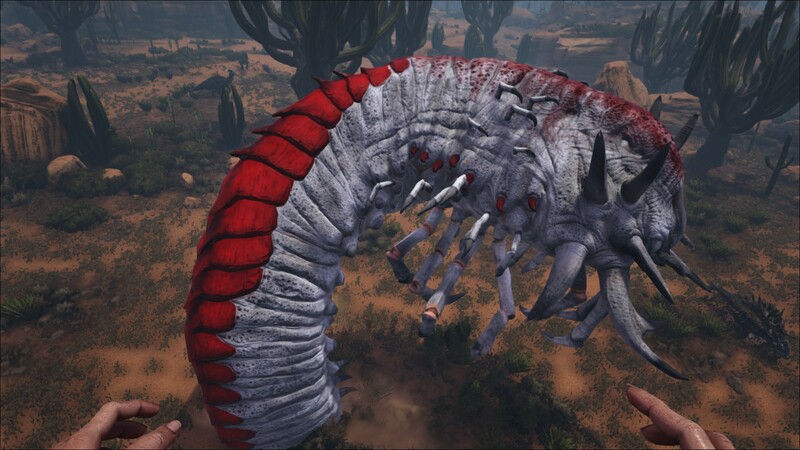 The Deathworm is one of the Creatures in ARK: Survival Evolved. It is available in the Scorched Earth and Ragnarok DLCs. A variant, the Iceworm Male is also available on Ragnarok. The titanic Khorkoi arrakis is commonly called a "Death Worm" by the locals, though I'm not certain that it is actually a worm. It shares some similarities to some segmented worms, namely the aquatic Eunice aphroditois, but it's biology doesn't seem consistent with other members of the annelid phylum. However, the "death" part of its name could not be more spot on. Khorkoi is without question the apex predator of this desert. It will devour anything that dares to set foot in the Endless Dunes, regardless of size or ferocity. Khorkoi spends most of its time burrowed beneath the desert sands, exploding to the surface only to devour its prey in a single bite. The only chance of surviving a Khorkoi attack is if its initial lunge misses, as it's momentarily immobile afterwards. Theoretically, that could provide a brief opportunity to escape its territory. I wouldn't count on such luck, though. Attempting to tame Khorkoi will almost certainly result in failure and a very painful death. Any survivors in this desert should avoid Khorkoi territory at all costs. Based on research conducted by Helena, the Deathworm acts as a natural barrier to keep animals and humans inside the world which she speculated to be a space station posing as a real ecosystem. The Island doesn't have this problem due to it being surrounded by water, which the "Scorched Earth" world lacks. Additionally, the huge population of large predators living in a wasteland devoid of prey confirmed her previous hypothesis that her new environment was artificial. Being a territorial creature, the Deathworm will attack any player who wanders too close to it. When mobile, the Deathworm will move just under the sand, appearing as a small, oscillating sand heap. A provoked, mobile Deathworm will chase players until out of range, and can be quite tenacious in their pursuit. Once within range, the Deathworm will emerge from the ground to engage in melee combat. It will simply chain melee lunges and will only move while emerged to readjust its attack direction. If the prey attempts to escape, the Deathworm will simply return below the surface to re-enter its mobile phase and pursue the victim until the victim gets far out of range or is killed. It has a keen hatred for Wyvern, Rock Drake and Reaper and will shift its attention over any other tamed preys if they are nearby. An ice-themed version of the Deathworm, found on Ragnarok inside the Frozen Dungeon. It has a light blue color scheme with white appendages and grey claws. The Deathworm - Manticore Arena is a variant of the Deathworm that is summoned by the Manticore. The ocean of sand surrounding the Scorched Earth is patrolled by the appropriately named Deathworm, a burrowing predatory invertebrate of titanic proportions. Resembling a gigantic worm (or perhaps a leech) with slicing mouthparts and clattering vestigial legs, these blind, nightmarish creatures have excellent hearing and will attack almost anything they detect moving across the dunes, bursting up from below to seize their prey. Due to their extremely territorial nature, very little else is known about Deathworm behavior. This section displays the Deathworm's natural colors and regions. For demonstration, the regions below are colored red over an albino Deathworm. The colored squares shown underneath each region's description are the colors that the Deathworm will randomly spawn with to provide an overall range of its natural color scheme. Hover your cursor over a color to display its name and ID. For example, "cheat SetTargetDinoColor 0 6" would color the Deathworm's "head and sides" magenta. 5The Deathworm is incapable of drowning. The Deathworm bites the target. Deathworm habitats are located all over the map among the large sand dunes. The best strategy is to team up with another survivor, and take turns to distract - and attack. A Rex can also make easy work of it as long as it has more than 5000 health and 400% damage. With these stats, the Rex will usually walk away with only about 2000 health lost. Using a Wyvern and a Rex, the Rex can draw the Deathworm out and while the Rex is attacking, the Wyvern can land and attack. If the Deathworm dives or begins to target the Wyvern, the Wyvern can fly away until the Deathworm is focused on the Rex again. The Megatherium's bug-killing abilities are also worth noting as being effective on Deathworms. A rideable creature is very good to have, as going on foot could risk your life. A high level Rex can fight one Deathworm safely. Wyverns are also good for taking care of a Deathworm due to their high DPS, especially Lightning Wyverns. Just be careful, as Wyverns have a relatively low base health and no armor from a saddle, making them easier for the Deathworm to kill. Deathworms could attack at any time. If you are traveling in the sand dunes along the outskirts of the map, you can sometimes see a sandheap moving around. If you're not on the hunt for Deathworms, you should watch out. Alpha Deathworms are even bigger and stronger than the normal Deathworms. 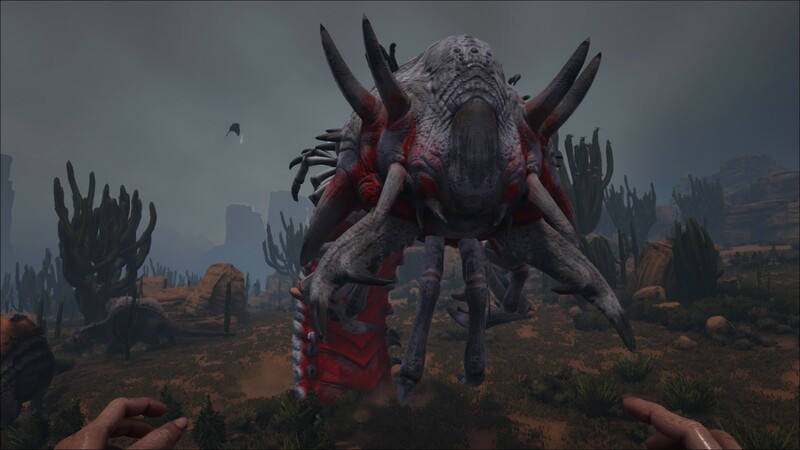 If you are using a large creature to take down a Deathworm, like a Rex or Rock Elemental, they may get stuck on each other, which will prevent your tame from escaping. The Rock Elemental is resistant to all forms of damage except for armor piercing bullets and explosives. Along with its great offensive capabilities, it offers the best protection against a Deathworm. However, it is rather difficult to tame a Rock Elemental. It is recommended to either have 2 high level Elementals or 1-2 High Level Rex(es). Rexes seem to be the best way as they do more DPS than Rock Elementals. Gigas and Wyverns are the most ideal. This creature has striking similarities to an insect known as an [Wikipedia:antlion antlion] which employs a hunting strategy of creating pitfall traps within the sand to catch insects. There is a small section of the dossier where this creature is referred to as "Lineus" ([Wikipedia:Lineus a genus of nemertine worms]), despite being referred to as "Khorkoi arrakis" in the rest of the dossier. Besides their horns, Deathworms are the only source of Leech Blood, Black Pearls, and Angler Gel in Scorched Earth aside from fishing. 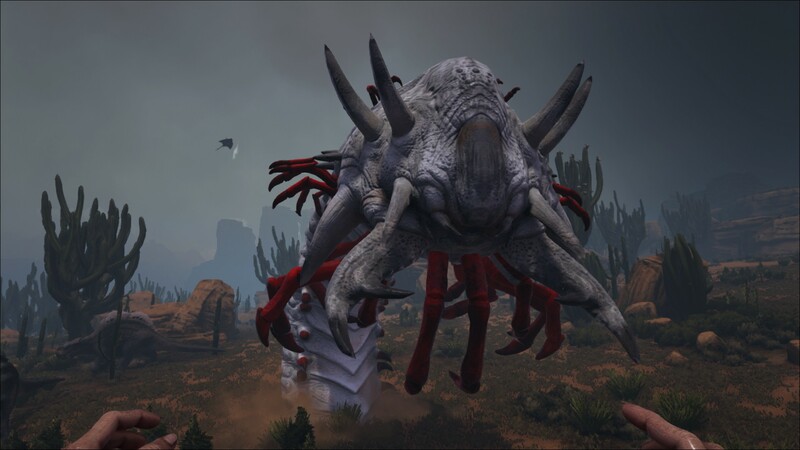 The generic name "Khorkhoi" refers to an "Olgoi-Khorkhoi", better known as the [Wikipedia:Mongolian Death Worm Mongolian Death Worm], a cryptozoological creature that terrorizes the Gobi Desert and probably inspired ARK's Deathworm. The term "Arrakis" in the creature's species name might refer to the planet Arrakis, a fictional desert planet pivotal to the events of the well known science fiction series Dune by Frank Herbert. It's worth mentioning that the planet Arrakis is inhabited by massive, carnivorous, burrowing sandworms that bear many similarities to the Deathworm. It's possible to get stuck by the Deathworm as it surfaces to attack, especially when on a larger mount such as a Wyvern. You will be locked in place and unable to escape. Use extreme caution when traveling or even landing on the Outer Sands. A Deathworm can destroy an adobe house in a matter of seconds. Caution is advised if you want to live in the desert surrounding the map. Alpha Deathworm are very easy to spot thanks to their glowing red aura that shows up even if they are underground. It originally will shift its attention towards nearby tamed Wyvern, but both Rock Drake and Reaper, both tamed from birth, are also mainly targeted by Deathworms due to the similar method as that of Wyverns. 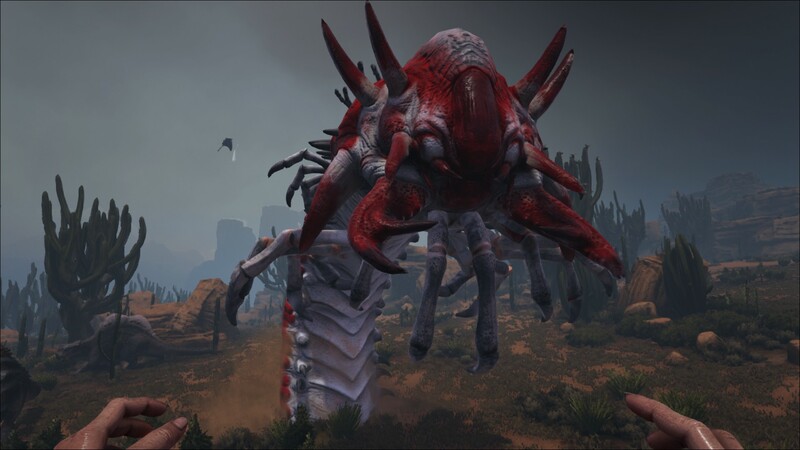 Prior to v287.110, Corrupted Deathworms existed on Extinction. Do not summon a tamed Deathworm, because after a few minutes, when fighting, will just be stuck in one spot, and unrelentingly attack one spot, so they don't do much. Finding Death Worms can be hard but you can use your orbit cam/selfie cam to look under the mesh as you go over the terrain. Using a Pteranadon and a Giganotsauras you can easily clear 5-10 horns and hour rotating between the spawn points. There are two spawn points right next to each other on Scorched Earth at approximately 55-90 on the ridge. This page was last edited on 14 April 2019, at 16:24.